Reliable identification of foreign bodies, injuries, tumours etc. in the anterior segment of the eye is an essential condition of medical treatment. Such an examination first requires a bright, high-contrast image which is obtained by lateral illumination. This was initially provided by sunlight. Although daylight was bright enough, as soon as possible it was replaced by a variety of artificial light sources because such new equipments were much easier to use. However, until the beginning of the 20th Century the light thus produced was altogether much too dim, despite optical concentration of the rays for so-called focal illumination. 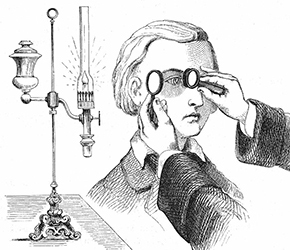 The introduction of the very bright “Nernst lamp”, when combined with slit-light illumination by the Swedish ophthalmologist Allvar Gullstrand, was therefore an enormous leap forward towards „optimal examination conditions“. Subsequently devices were developed which Spaltlampe_2consisted of an adjustable slit-light source, as well as a stereomicroscope and chin-support that could be positioned to suit the patient. 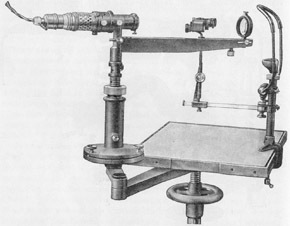 Very rapidly after their suitability for employment by ophthalmologists had been tested, Zeiss Jena began serial production of such devices, from now on known as „slit lamps“, and soon thereafter was followed by the Haag-Streit company in Bern. Then both firms concentrated on optimising the examination conditions as well as on expanding the possibilities for examination by various additional devices, in the development of which famous ophthalmologists, often with very different specialities (and personalities) played a crucial role. The Second World War, in which the Zeiss-factory in Jena was destroyed, was a difficult period for the further development of the slit lamps. Nevertheless,spaltlampe_3 concerned and foresighted scientists enabled the development and manufacture of the slit lamps to be partly shifted to what was then West Germany. A few years afterwards, a response to this development was the production in Bern of an especially efficient slit lamp with an entirely novel appearance. Meanwhile in many other parts of the world the optics industry began manufacturing such instruments in order to participate in the lucrative market for slit lamps, since by now they had become part of the standard apparatus for every ophthalmological clinic worldwide. 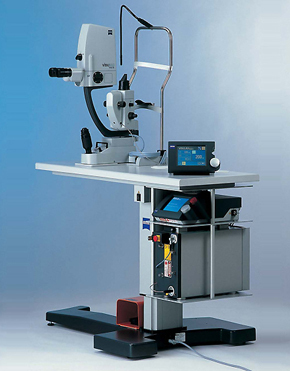 A new advance in the ophthalmological significance of the slit lamp was made at the end of the 20th Century, this time towards „therapeutic device“, when slit-lamp-controlled laser treatment was introduced. This made the slit lamp definitively an indispensable instrument of ophthalmology, providing both diagnostic information and now also therapy.